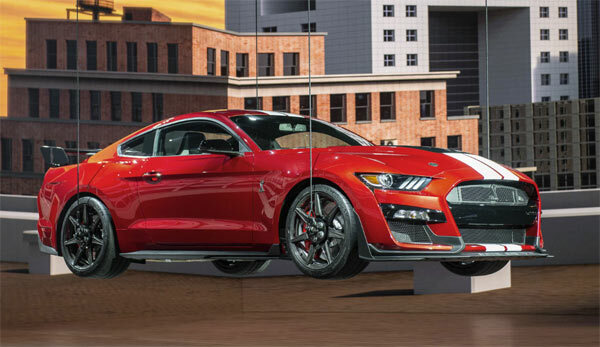 There’s been much anticipation for the release of the 2020 Ford Mustang Shelby GT500, but it’s now here having been unveiled at the 2019 North American International Auto Show, Detroit this week. The GT500 will be available this fall, with Ford stating it is the pinnacle of achievement for the sixth-generation version of the car. After all the anticipation everybody wants to now know the vital stats. Everything is wrapped around a 5.2-liter V-8 engine, fed by a 2.65-liter Eaton supercharger at 12psi. The superchargers has been low mounted so as to keep the hood streamlined without a bulge, but does have a very large hole with louvers and rain shield. The engine block is the same as the one in the Shelby GT350, but everything else has been reworked. The GT500 has a cross plane crank, a thicker block, different valves, an oil pan with active baffling and a magnesium tower brace to stop engine twisting. There is also six heat exchangers and an auxiliary radiator to keep those temperatures down. The transmission will be a Tremec 7-speed dual-clutch using paddle shifters (no manual version as there isn’t one to keep up), with four drive modes – normal, weather, sport, drag and track, along with a line 1ock. Amazingly, the final power output hasn’t been announced with Ford saying they will do so nearer the launch time. One thing is for sure is that it will have 700+HP. Wheels come in the form of 20 inch cast aluminiums with Michelin Pilot Sport4 summer tires. There’s also carbon fibre versions with Michelin Pilot Sport Cup 2 superhero tires. These sit on electronic dampers with four ride height sensors, huge 16.5-inch 2-piece front rotors with 6-piston fixed calipers upfront and 14.6-inch rotors, 4-pistons by Brembo on the back. The exterior has been given its own makeover, with wider front fenders to house wider wheels. Hood pins come as standard, the front grille allows in 50% more air than the GT350. The rear diffuser is made from composite materials. Interior creature comforts include a 8.0-inch touchscreen, 12-inch digital gauge cluster, Apple CarPlay and Android Auto, with options for a B&O audio system and Recaro race seats. 11 colors will be available for the GT500, with each vehicle coming with an individually numbered dash plaque, signed by the two people who hand build the vehicle. Prices are yet to be announced, but it’s for sure the most advanced GT500 released up to now.